MACAU, Nov. 30, 2017 /PRNewswire/ — Macau’s premier integrated resort is teaming up with one of the world’s most celebrated chefs for a global culinary first, as City of Dreams announced that it will collaborate with the legendary Alain Ducasse on two new restaurants and a bar at its hugely anticipated Morpheus Hotel as part of the resort’s phase 3 launch. The phenomenal collaboration with one of the world’s most decorated chefs, will result in the opening of an entire floor dedicated to two Ducasse restaurants and a bar at the forthcoming Morpheus Hotel, which is scheduled to open at City of Dreams next year. The opening of the two side-by-side dining destinations will make City of Dreams the only hotel in Asia to feature two restaurants and a bar by the chef. Alain Ducasse at Morpheus, first Alain Ducasse fine dining restaurant in Macau, will serve up the signature expression of French contemporary haute cuisine that the chef is best known for, transporting diners to France from the first bite until the last. It will be the most exclusive restaurant in Macau. Designed by Jouin-Manku, the same designer of Alain Ducasse‘ au Plaza Athénée haute-cuisine restaurant, Alain Ducasse at Morpheus will pay tribute to the great tradition of Chinese gardens and will communicate to the guests a deep feeling of balance and serenity. It will altogether display an extraordinary selection of the most magnificent and noble materials. The décor of the bar will be energetic and vibrant. Voyages by Alain Ducasse, meanwhile, is a new concept that has been tailor-made for City of Dreams and will offer a unique take on Asian cuisines inspired by Ducasse’s travels over the past 30 years, as well as his most recent culinary discoveries. The design will be an homage to raw and noble material, such as solid wood, stone, lacquer, galvanized by vibrant colours. "Projects of such a broad scope and high ambition are not that numerous in the world today. It is a great honor for me to be part of it," said Ducasse of the collaboration. "When I first met with Lawrence Ho, I instantly felt the chemistry. Our dialogue on the two restaurant identities I will bring to Morpheus was very rich." 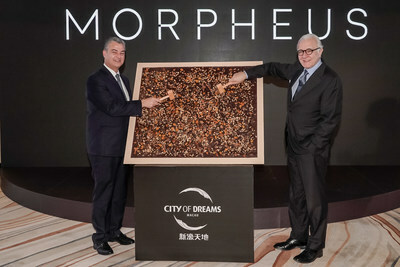 Ducasse also praised the ambition of the Morpheus project, highlighting that the hotel will add a new dimension to both City of Dreams and the city of Macau, embodying a smart and sophisticated vision of the contemporary art of hospitality. "I always create and never duplicate — each of my venues is different and reflects the mood of its location," said Ducasse. "I always start from the soul of the place and from clients’ expectations to create a cuisine that is specific and that resonates with the location and the people." Mr. Lawrence Ho, Chairman and CEO of Melco Resorts & Entertainment, the company which owns and operates City of Dreams, said: "Today, we’re celebrating a new partnership. It is our pleasure and, truly, a real honor to be able to say that Morpheus, the new flagship tower of our City of Dreams resort, will soon be anchored by not just one but two new restaurants by none other than one of the greatest living chefs of our time: Alain Ducasse." ‘We shared the same passion to create, that itch to bring out-of-this-world experiences into our world. To make dining more innovative. Better. Cooler. At the heart of that magnificent exoskeleton, we are creating an Asia-first hotel with an entire floor dedicated to two Ducasse restaurants. And just like the god after which Morpheus was named, this place will be the thing of dreams. It’ll become an icon of the new Macau." Mr. Ho also reaffirmed his commitment to help transform Macau into a world center of tourism and leisure, and to elevate Macau’s presence and recognition on the global dining landscape following its recent designation as a UNESCO Creative City of Gastronomy. This press release contains forward-looking statements. These statements are made under the "safe harbor" provisions of the U.S. Private Securities Litigation Reform Act of 1995. The Company may also make written or oral forward-looking statements in its periodic reports to the U.S. Securities and Exchange Commission (the "SEC"), in its annual report to shareholders, in press releases and other written materials and in oral statements made by its officers, directors or employees to third parties. Statements that are not historical facts, including statements about the Company’s beliefs and expectations, are forward-looking statements. Forward-looking statements involve inherent risks and uncertainties, and a number of factors could cause actual results to differ materially from those contained in any forward-looking statement. These factors include, but are not limited to, (i) growth of the gaming market and visitation in Macau and the Philippines, (ii) capital and credit market volatility, (iii) local and global economic conditions, (iv) our anticipated growth strategies, (v) gaming authority and other governmental approvals and regulations, and (vi) our future business development, results of operations and financial condition. In some cases, forward-looking statements can be identified by words or phrases such as "may", "will", "expect", "anticipate", "target", "aim", "estimate", "intend", "plan", "believe", "potential", "continue", "is/are likely to" or other similar expressions. Further information regarding these and other risks, uncertainties or factors is included in the Company’s filings with the SEC. All information provided in this press release is as of the date of this press release, and the Company undertakes no duty to update such information, except as required under applicable law. The Company, with its American depositary shares listed on the NASDAQ Global Select Market (NASDAQ: MPEL – to be changed to MLCO), is a developer, owner and operator of casino gaming and entertainment casino resort facilities in Asia. The Company currently operates Altira Macau (www.altiramacau.com ), a casino hotel located at Taipa, Macau and City of Dreams (www.cityofdreamsmacau.com ), an integrated urban casino resort located in Cotai, Macau. Its business also includes the Mocha Clubs (www.mochaclubs.com), which comprise the largest non-casino based operations of electronic gaming machines in Macau. The Company also majority owns and operates Studio City (www.studiocity-macau.com ), a cinematically-themed integrated entertainment, retail and gaming resort in Cotai, Macau. In the Philippines, a Philippine subsidiary of the Company currently operates and manages City of Dreams Manila (www.cityofdreams.com.ph), a casino, hotel, retail and entertainment integrated resort in the Entertainment City complex in Manila. For more information about the Company, please visit www.melco-resorts.com. City of Dreams is an integrated entertainment resort that has established itself as a premier leisure and entertainment destination in Macau. Located in the heart of Cotai in Macau, it combines electrifying entertainment, a diverse array of accommodation, regional and international dining, designer brand shopping and a spacious and contemporary casino. The resort brings together a collection of world-renowned brands including Crown, Grand Hyatt and Dragone to create an exceptional entertinment experience that aims to appeal to a broad spectrum of visitors from around Asia and the world. City of Dreams features a 420,000-square-foot casino with approximately 500 gaming tables and approximately 1,250 gaming machines; over 20 restaurants and bars; an impressive array of some of the world’s most sought-after retail brands; "The House of Dancing Water", the world’s largest water-based extravaganza showcased in the purpose-built Dancing Water Theater, represents the live entertainment centerpiece of City of Dreams’ overall leisure and entertainment offering. A comprehensive range of accommodation options at City of Dreams include Crown Towers offering approximately 300 guest rooms, The Countdown offering approximately 300 guest rooms and Grand Hyatt Macau offering approximately 800 guest rooms. In addition, Morpheus, the new hotel at City of Dreams designed by the late legendary architect Dame Zaha Hadid, is expected to commence operation in 2018, offering approximately 780 guestrooms, suites and villas. For more information please visit: www.cityofdreamsmacau.com (Official Website) and www.cityofdreamsmedia.com (Media Portal). For The House of Dancing Water information, please visit www.thehouseofdancingwater.com (Official Website) and www.thehouseofdancingwatermedia.com (Media Portal).